O, Friend Where Art Thou? 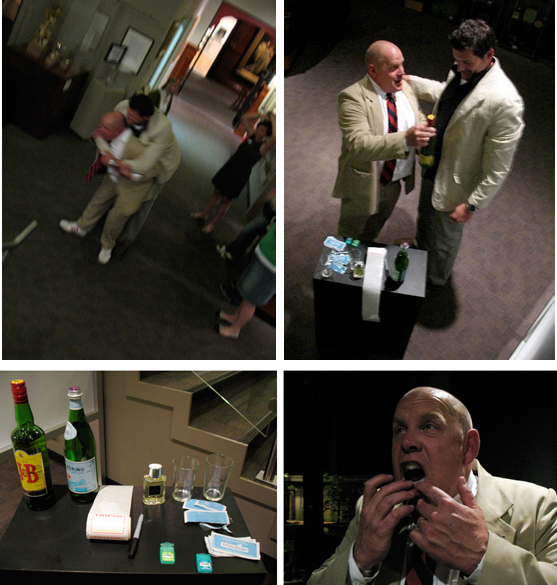 John expresses to be your friend and offers you a name tag, scotch, sparkling water, a breath strip, a white strip, perfume and a piggyback ride through the gallery. You are invited to question “what are your own protocols or rules of what makes a “Friend”. John Boehme greets me a “a friend station” a I write my name on a tag and together we place the burnt plastic tasting pocketpak breath strip/holy wafer on our tongues; I refuse the scotch, but Boehme takes a hit (his 9th? of the evening). I drink the sparkling water while Boehme adds another layer of Paco Rabanne to his already flamboyant persona. Boehme continues to increase his appeal with a whiter smile via the graphic insert of a whitestrip. I ponder over the piggyback ride. But how can I refuse he is so friendly, fresh, inviting and willing to carry me. I am heavier than he thinks or is it the scotch that makes our wordless trip past the paintings and sculpture awkward. We come to another “friend station”, we shake hands and even hug. I stick around and observe him befriend some one else. Later I walk home in fresh night air but smell of sweet sweat. My youngest friend has 1,068 friends on a social networking site. I am perhaps his most elderly friend. I think friends are rare; I cannot love the crowd. The time, befriending each one 1,068s of individual singularity—that’s an arithmetic lesson beyond by my capacity. I don’t want that many friends, for there is not enough time to put them to the test by living with each one. I must choose a few. There is not enough time. A small number of friends does not characterize the friends themselves. Consider these legendary friendships: Harold and Kumar, Willow and Buffy, Frodo and Samwise, Sponge Bob and Patrick, Itchy and Scratchy. But these are from movies and TV. Perhaps, the interaction and dependency I do have with my digital friends is real? Maybe scrolling and strolling for friendships that never physically take place argue with materiality in favor of endless possibility. Friends? This is what I want. Satisfaction, honesty, narcissistic reflection, pleasure, goodness and good for you, reliable, to love before being loved, hope, assistance and your presence at my death. “Before you make a friend, eat a bushel of salt with him” – Concise dictionary of European Proverbs.